NHVR's new manual will cover tyres and wheels when it comes into effect in July. A breakthrough for better truck maintenance comes into force in most parts of Australia on July 1. That’s the start date for the first nationally consistent inspection manual for heavy vehicles. The manual is produced by the National Heavy Vehicle Regulator (NHVR), which holds sway everywhere except in Western Australia and the Northern Territory. The previous manual had not been updated since 2004, and each state had its own version with variations, so driving across a border could see you being nabbed for something which was OK somewhere else. The sections of the new manual most relevant to the trucking industry are on vehicle identification and dimensions; brakes; couplings; steering and suspension; wheels, tyres and hubs; structure and body condition; seats and seatbelts; lights and reflectors; mirrors; windscreens and windows; and trailers. One of several industry bodies which contributed to the review is the Australian Trucking Association. "The manual is pretty easy to follow," says Bob Woodward, technical guru with both the ATA and big eastern Australian operator Ron Finemore Transport. "It’s a big improvement on the previous heavy vehicle inspection manual. They’ve actually got some of the diagrams and photos right now. "It’s not a bedtime story but there’s lots of useful stuff in there." Take the section on wheels, tyres and hubs. The manual has obvious and common-sense stuff but there is also some specific information which a lot of operators and drivers wouldn’t know off the top of their heads. 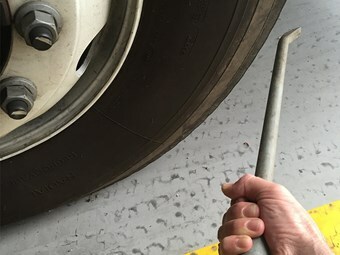 "a) A tyre does not have at least 1.5mm tread depth in a continuous band which runs around the whole circumference of the tyre and extends across at least 75% of the width of the tyre. "Note: Tread wear indicators are built into most tyres to indicate when tread depth reaches about 1.5mm. The depth of the tyre tread above these indicators is not included in the assessment of tread depth around the circumference of a tyre. "In effect, these requirements allow a tyre to be worn to less than 1.5mm tread depth on its edges (our emphasis), provided that at least 75% of the remaining width of the tyre has a minimum tread depth of 1.5mm around the whole circumference." Meanwhile point c) is fairly obvious when it comes to tyre rejection. "A tyre (including sidewalls) has deep cuts, chunking, bumps, bulges, exposed cords or other signs of carcass failure." Check out more about wheels and tyres in an upcoming issue of Owner//Driver.